For players living in Jordan : Qualify to play in Jordan National Cyber Security CTF Competition that will run its final round on 6th of July. For players living in Algeria : Qualify to play in Algeria National Cyber Security CTF Competition that will run its final round on 7th of July. For players living in Lebanon : Qualify to play in Lebanon National Cyber Security CTF Competition that will run its final round on 13th of July. 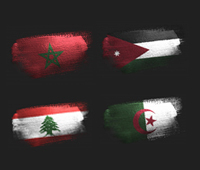 For players living in Morocco: Qualify to play in Morocco National Cyber Security CTF Competition that will run its final round on 20th of July.